Barack Obama is wrong on at least one first round game in the NCAA tournament as Michigan just upset Clemson. 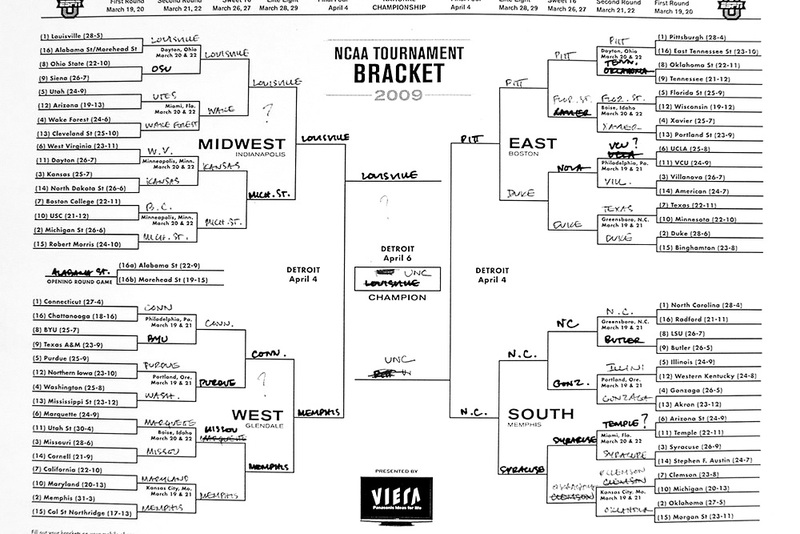 (Click on image for larger picture of Obama’s tournament picks). The new moderator often seems like he’s wearing a suit made for someone else – Russert – and as a result has yet to clearly establish why he got this gig instead of anyone else in the conga line of potential successors. Gregory is terrifically polished, well-informed, a good listener and has the talking points of both sides down cold. But he also seems more intent on covering the waterfront than digging for news, or in pushing the talking heads off their talking points. Recent interviews with Sens. Charles Schumer (D-N.Y.) and Lindsey Graham (R-S.C.) felt like a waterfront that went on for miles – an endless vista of chatter and spin. His exclusive interview with Defense Secretary Robert Gates was thoughtful and probing, but not particularly memorable. BOTTOM LINE “Meet the Press” is now the de facto safe show on Sunday morning – “safe,” that is, for those being interviewed. Gregory has been handed perhaps the most important program in television journalism. It’s time to start acting like the king who rules wisely yet ruthlessly. Otherwise, his legacy will match that of Garrick Utley or Bill Monroe – moderators who were highly respected but not highly feared. In this job, it’s vital to be both. 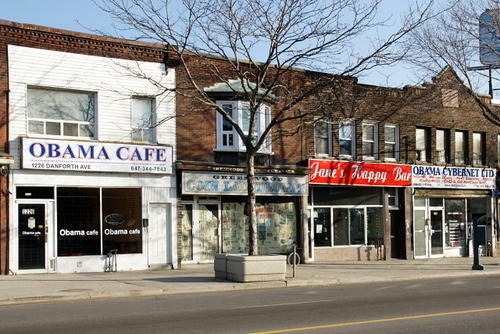 People in Toronto who like the idea of going to an Obama-themed cafe now have a dilemma–deciding which one to go to. There are two of them a few doors apart on Danforth Avenue. The Torontoist has information on both of them. Another view of the question of whether Barack Obama is a socialist (video above). Attorney General Eric H. Holder Jr. on Wednesday outlined a shift in the enforcement of federal drug laws, saying the administration would effectively end the Bush administration’s frequent raids on distributors of medical marijuana. In the Bush administration, federal agents raided medical marijuana distributors that violated federal statutes even if the dispensaries appeared to be complying with state laws. The raids produced a flood of complaints, particularly in California, which in 1996 became the first state to legalize marijuana sales to people with doctors’ prescriptions. Graham Boyd, the director of the American Civil Liberties Union drug law project, said Mr. Holder’s remarks created a reasonable balance between conflicting state and federal laws and “seem to finally end the policy war over medical marijuana.” He said officials in California and the 12 other states that have authorized the use of medical marijuana had hesitated to adopt regulations to carry out their laws because of uncertainty created by the Bush administration. This is the right move with regards to medicinal marijuana. Hopefully later in his term Obama will tackle the more politically difficult issue of decriminalizing marijuana.